DSLRs are becoming more popular with outdoor videographers and are used everywhere in the TV/Movie industry. Making the move from video cameras into DSLRs can be a bit challenging. We've asked and answered some of the top questions when it comes to choosing a DSLR Lens. How does the focal length of a lens effect the image? Without getting into the physics of it, every lens is defined in millimeters, and this is defined as the camera's focal length. 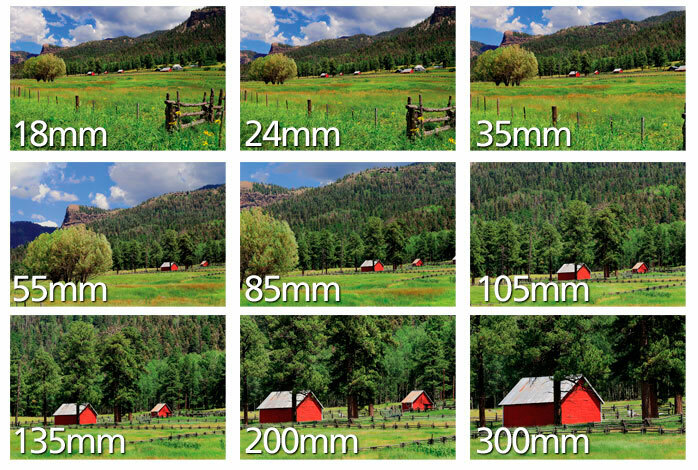 Think of it this way: focal length has an effect on how much of a scene you can see through the lens. A short focal length allows you to stand close to your subject so that they fill the frame and things in the background seem farther away than normal. Wide-angle Lenses have short focal lengths and a wide-angle of view. Examples of short focal lengths are 15mm, 20mm, 35mm. A long focal length allows you to stand far away from the subject so that it still fills the frame, but that things in the background seem closer than normal. As the focal length of the lens increases, the viewing angle decreases (less in your shot). Examples are 85mm, 105mm, 300mm. Standard lenses are going to be your all-around lens. First, we need to take a look at the camera's image sensor. Most of your professional DSLRs have a "full-frame" image sensor. On a full-frame sensor, the standard lens is 50mm. A 50mm lens on a full-frame DSLR captures roughly the same view as the human eye. 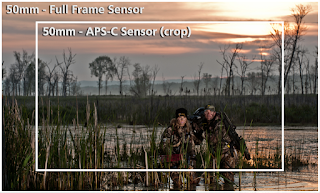 When you place a 50mm lens on a DSLR with an ASP-C Sensor (cropped sensor) it is like placing a 75mm on a full-frame DSLR (less in your shot). Therefore, to get the equivalent of a 50mm on a regular DSLR, you should use a 35mm lens. Prime lenses have a fixed focal length. Meaning, the only way to make your subject bigger/smaller is by moving yourself closer or farther away from your subject. Prime lenses only give you one focal length, however they are less expensive and lighter than zoom lenses. 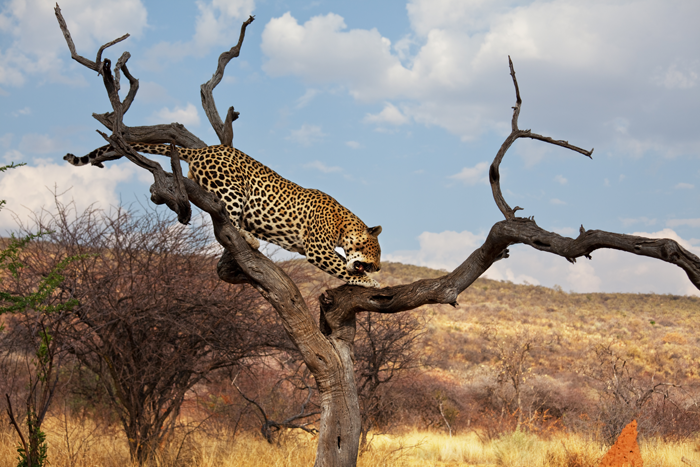 Prime lenses also tend to give you a faster maximum aperture. Examples of a prime lens would be a lens labeled as "24mm", "50mm", "80mm", "100mm" etc. Zoom lenses have variable focal lengths, which you select by twisting the lens barrel. Most people are familiar with zoom lenses and are included in most DSLR kits. They’re great for re-composing images without having to change lenses and the flexibility makes them convenient to use for all kinds of situations. However, you often pay for the convenience with increased weight and compromised optics. Typical focal length ranges are given as the minimum and maximum focal length, e.g. 18-135mm, 17-50mm, 24-70mm. What is considered a wide-angle lens? Wide Angle lenses allow you to fit a lot into an image. They are useful for landscapes and are great for use in a ground blind where you have a limited amount of space but a lot to get in the shot. If your ASP-C DSLR camera kit includes an 18mm-___ Lens, remember that this will give you the effect of a 27mm Full-Frame DSLR. 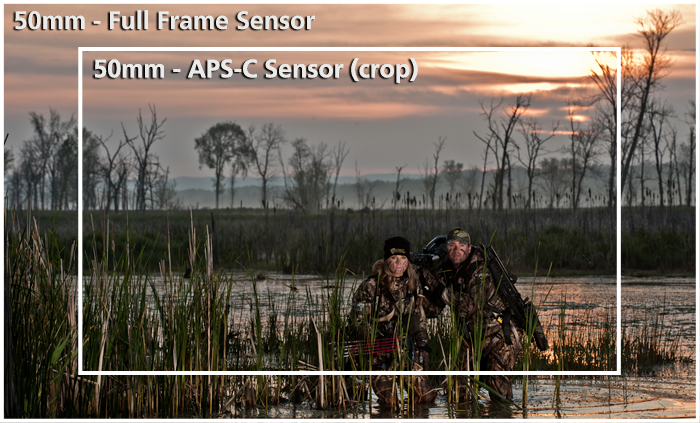 You will want to look at lenses in the range of 10mm to create this "wide-angle" effect on your APS-C Sensor Camera. However, be aware that when using wide angles there is some distortion at the edges, especially at the widest setting. Subjects closer to the lens will seem much larger than distant ones. Compose your shot to embrace (or avoid) these effects. An extreme case of a wide-angle lens is the Fish-Eye Lens. When would you use a telephoto lens? Telephotos are ideal when you can't get close to your subject or when you are looking for a frame filling landscape. They’re essential for getting close to timid wildlife, too. However, they are prone to camera shake, so use a tripod during the exposure to ensure you get sharp pictures. Pictures taken on telephotos tend to look 'flat', and a bit more two-dimensional. They compress the background and foreground so that it’s hard to tell how far distances are between objects. Rocky Mountain Elk Bugling from Jonathan Black on Vimeo. When would you use a Macro Lens? Macro lenses allow you to get very close to your subject to produce images that are life size or larger. Macro lenses come in a variety of fixed focal lengths, ranging from 50 to 200mm. True macro is considered to have a reproduction ratio of 1:1 magnification or higher. 1:1 simply means that the subject size on the image is the same as the size of the subject in real life. Beware of zoom lenses that say they are Macro. They will typically only give you a 1:3 reproduction ration (that's 1/3 life-size on the image sensor). Macro photography/ videography is good to use when your subjects are small such as insects/bugs or flowers. Macro lenses can provide you with some really good B-roll shots. Macro Insects (7D + 100mm F2.8L IS Macro) from Hampton Road Studios on Vimeo. Item Reviewed: Understanding DSLR Lenses 9 out of 10 based on 10 ratings. 9 user reviews.